Dr. Nirmala Menon leads the Digital Humanities and Publishing Research Group at the Indian Institute of Technology (IIT), Indore, India. She is a faculty member of the School of Humanities and Social Sciences (HSS), Discipline of English, IIT Indore. She is the author of Migrant Identities of Creole Cosmopolitans: Transcultural Narratives of Contemporary Postcoloniality (Peter Lang Publishing, Germany, 2014) and Remapping the Postcolonial Canon: Remap, Reimagine, Retranslate (Palgrave Macmillan, UK 2017). She has published in numerous international journals and speaks, writes and publishes about postcolonial studies, digital humanities and scholarly publishing. She directs Ph.D. students is in their projects and runs DH projects from the research lab at IIT Indore. Her primary area of research is Postcolonial Literature and Theory. 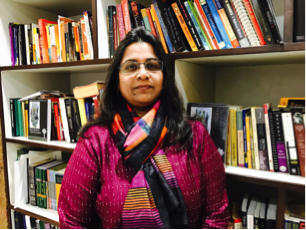 Her focus is on the comparative study of twentieth century postcolonial literatures in English, Hindi and other languages. Digital Humanities, Gender studies, Globalization and Translation studies are additional areas of research. Her interests are multilingual but also interdisciplinary; her research examines the ways in which literatures from different non-Western languages influence and can redefine and reframe postcolonial theoretical concepts. She is also on the Advisory Board of the Open Library of Humanities (OLH) and Chair, (2016-17) CLCS Global South Forum, Modern Language Association (MLA), Editor Post-colonial Indian Literature at litencyc.com The Literary Encyclopedia. She is also on the editorial and advisory Board of various scholarly journals and articles. She is the Joint Secretary of FSLE-India for M.P. East Region.